Mullard horizontal view nixie with 13 mm. digits 0-9 (no decimal point is provided). It has a wire ended B13D base. The primer cathode (kpr , pin 4) can be used to accelerate the ignition times of cathodes by taking it via an 18 MΩ resistor to a -180 V supply. Cathode currents should be in the range 1.5 mA (for full coverage) to 3.5 mA (average). Peak current should not exceed 12 mA. 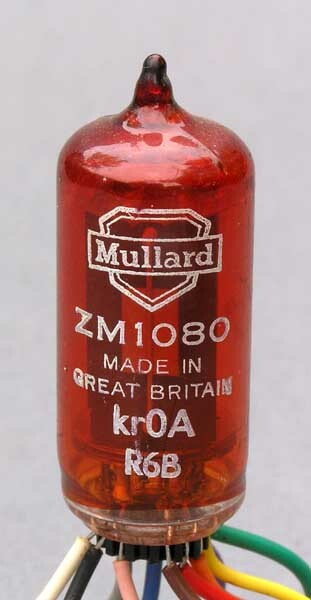 ZM1082 is electrically identical but has no red filter. ZM1080 / ZM1082 datasheet 1970 . (English datasheets can be found on Frank Philipse's website and Ake Holm's website). See also: Bulk gas glow discharge.